Copyrights: Tai Chi Productions. All rights reserved except copying for educational, non profit purpose. For example you can copy this article for your fee paying students and conference attendees provided you do not charge a fee for it. This is an integral part of Dr Lam’s book “Teaching Tai Chi Effectively“, and should be interpreted in relation to the complete book. When you are teaching tai chi, your students’ safety is of paramount importance. Teaching safely makes you a more effective teacher. No matter what your students’ objectives are, any injury will set them back from achieving them. It seems likely that if we don’t take on this responsibility ourselves, governments might soon force us to do so. To safeguard the public, many countries are now bringing in regulations for the conduct of exercise classes. It may not have happened with tai chi classes yet in your country, but it could eventually. The benefit for us, if we take on this responsibility, is that we can probably do a better job than the government. My colleagues and I have worked hard to make our Tai Chi for Health programs the safest possible and we teach the precautions outlined below in our workshops. To be certified to teach, participants must pass the test for safe teaching. The vast majority of tai chi instructors/leaders who have attended our workshops support this measure. Many told us that they wanted to learn about safety but couldn’t find out where to learn it. Gary, a tai chi instructor for 10 years, had been suffering from back pain for the same length of time. He told me that after attending my workshop, he stopped doing the straight leg toe-touch exercise in his pre-tai chi warm up and his back pain has disappeared. 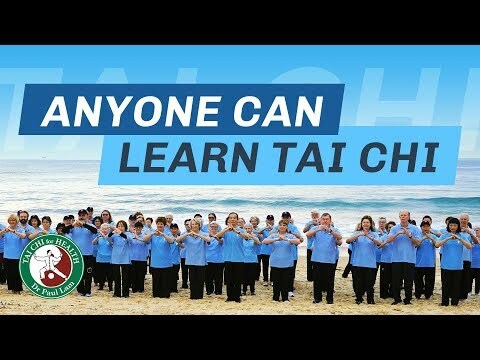 In 2005, Accident and Compensation Corporation (ACC), a government body in New Zealand, paid for 10,000 older adults to attend tai chi classes to improve their health and prevent injury. The ACC recognises the importance of safe tai chi teaching and invited me to help them design safety measures and set up training courses for class teachers, to be used throughout the country. I have used essentially the same guides as I do in my workshops. These are easy to learn and most of them are such common sense that you may be doing them already. There are significant differences in different tai chi styles and schools, therefore the safety requirements for them are different. My guide here is based on commonly accepted variations of the ‘soft’ tai chi styles such as Yang and Sun. If you have any doubts about the forms you teach, I recommend you check with appropriate health professionals. All my Tai Chi for Health programs are designed in consultation with medical experts in their respective fields, with safety as the top priority. For example, the Tai Chi for Arthritis program has had input from arthritis specialists (rheumatologists and physiothera-pists). The notion that ‘my teacher taught me this, so it must be safe’ is just as faulty thinking as saying that my teacher knows everything there is to know about medicine now and into the future. There is a well-known saying in China that if you keep stamping on a stone (performing the Chen-style movement Golden Guard Stamping on the Ground) until you’ve bored a hole in the stone, you are then good enough to graduate from the Chen-style. I often wonder how many people have crushed their knee cartilages by ‘stamping on a stone’ like this! In fact I know of many Chen stylists who have suffered from serious problems with their knees. Once you have the intention to minimise injury, you can find ways to do so. Start by using my guide here and make sure you constantly upgrade your knowledge. Remember, medical knowledge is updated constantly. You may have already been taking many of these precautions, but safety is so important that it is always worth revising your knowledge. There are many medical conditions that are not obvious, even to a doctor’s eyes. An exercise teacher is not a health professional, so be aware of your limitations. Dr Pam Kircher, a medical doctor from the USA, says that even though she is li-censed to practice medicine, she never does so during a tai chi class. The reason why? Although she knows medicine and may be correct in the information she gives, she doesn’t have the student’s medical chart in front of her to review their history, lab tests, etc, so it’s possible to miss something. For that reason, she doesn’t feel it’s right to give medical advice to students. She says, ‘When I teach tai chi, I wear my tai chi hat, not my medical doctor hat.’ Being a medical doctor too, I don’t practice medicine in my tai chi classes; I refer students back to their health professionals. One day a student reminded me that I am his doctor, so I asked him to make an appointment to see me at the clinic where I have access to his medical records and our medical equipment. When students enrol, consider asking them to complete and sign a medical waiver form for your protection. In that form there should be a statement to the effect that students acknowledge by signing the form that it is their own responsibility to tell you if there is any medical condition that may affect them doing tai chi. It is also the student’s responsibility, if they have any medical condition, to get their health professional’s approval to take your class and for them to provide you with instructions about any special precautions that must be taken. I have provided a sample waiver form in the Appendix. Be sure to check with your legal adviser to ensure this form complies with your own country’s legal requirements. 1. General care. 2. Exercise care. 3. Specific precautions for tai chi. 4. Precautions for people with special medical problems. Ensure a safe learning environment Make sure your practice environment is safe. For example, make sure that it has good lighting, is clear of obstacles, has a non-slippery surface with no loose mats and is a comfortable temperature. I once visited a class in its practice hall. The teacher is also a painter and the hall had some of his paintings (some of which were framed with glass) spread out on the floor in one corner. Can you imagine what might have happened if one of his students had stepped on a painting and slipped on the glass? Whether your class is being held inside a building or outside in the open air, make sure that the location has easy access. Avoid stairs and also places that are too cold, too hot or too windy. If you are training for a long time, particularly when it is hot, your students may become dehydrated. Drinks should be provided, or ask your students to bring their own. Prepare for emergencies Have a written emergency procedure at hand that includes emergency phone numbers for students and the ambulance service’s phone number. Ensure there is a telephone handy. In your emergency procedure, write down your venue’s full address and details of how to get there. Allocate different tasks to your assistants to do. For example, in the case of a student who collapses suddenly (which can happen anywhere), the teacher can tend to the student, assistant number one will call the ambulance and assistant number two will keep an eye on the other students and open the door for the ambulance service personnel. In most Western countries, exercise leaders are required to have current first aid training. I believe tai chi teachers should do likewise. I also believe that it would be a good idea for all adults to have this training. If any of your students has a medical condition which might affect them doing tai chi, find out from their health professional what precautions you should take. Create a relaxed atmosphere Create an atmosphere in which your students feel comfortable talking to you about their problems. Let your students understand that they should work well within their comfort zone. Stress to the students that they don’t have to compete with anyone else or push themselves to achieve anyone else’s standard. I once saw a teacher pushing a student into a lower stance because they could not bend low enough – this is a very dangerous thing to do. When you are aware of your limitations and take care with your own movements, you are much less likely to incur injury than when you have an unpredictable outside force pushing you. What is more, a teacher who does this could be accused of causing injury or assaulting their student. Get adequate insurance For your own protection, you should have insurance that is valid in your country. In this day and age, teachers should be cautious about the possible legal consequences of their actions. Be careful not to touch anyone. If touching is unavoidable, ask your student for permission, and then do so very gently. Avoid dangerous exercises There are some dangerous exercises that are not part of most recognised ‘soft’ tai chi forms, although they could be part of your warm up exercises. Here are some of the common ones. 1. Flexing or bending your neck backwards. This causes over flexing of the spine, with the risk that vertebral discs may cause injury to the nerves in the neck. 2. Bending down with straight legs to touch your toes. This is a dangerous movement. It can over flex the spine and can cause injury to the discs or nerves of the back. 3. Bouncing when doing a stretch increases the chances of ligament damage. 4. Ballistic (sudden, vigorous or violent) movements can be dangerous, especially violent stretches of the lower back and hamstring muscles. 5. Doing a sit up with your hands behind your head can become dangerous when you use your hands and arms to pull yourself up. This can overflex your neck and may cause compression of inter-vertebral discs. You can find more comprehensive technical information from sports medicine resources1. 1. Do not practice when you are very hungry, immediately after a full meal, or when you are very upset. 2. Begin your session with warm-up exercises and end with cooling-down exercises. These help prevent injury, pain and stiffness. The length and extent of the warm-up depends on the intensity of the exercise program. My Tai Chi for Health programs include a set of warm-up exercises that you can use. These are included in Chapter 8. 3. Avoid practicing in a place that is too hot, too cold or is windy. 4. Continue your session only for as long as you feel comfortable. Listen to your body and rest when you start feeling tired, are in pain, or lose concentration. 5. Don’t continue doing any movement that is painful or causes you discomfort. If you experience chest pain, shortness of breath or dizziness, or if additional pain in your joints persists, contact your doctor. 6. Move well within your comfort range. The first time you do a movement, stretch to only 70 percent of your normal range of motion and increase that range gradually. Many of the force-delivering movements in Chen-style tai chi have a higher risk of injury, so if you practice Chen-style, please take extra care and consult a health professional if you have any doubts. Do all movements slowly and gently, as consistent with tai chi principles, avoid using excessive force, be focused and aware of your body’s limits. If you follow the essential tai chi principles they will help you to minimise the risk of injury. 1. Wear loose, comfortable clothing and well-fitting shoes. 2. Gradually build up the length and number of practice sessions, aiming for about 20-40 minutes on most days (for older adults). A simple indication of how long to practice initially is the length of time you can walk comfortably at a steady pace. If you can practice for just 10 minutes in one session, you can do another 10 minutes after you have rested. 3. Avoid moving a student’s body and limbs to correct their position, if possible. If it is very important for you to do it, be sure to ask permission each time. If you move a student’s body or limbs, you may aggravate an existing injury (which may not be obvious to you or the student), or be accused of causing one. Joseph is a teacher who frequently twists and moves his students’ hands during his class. He thought that by asking the entire class once at his very first lesson, ‘If anyone has an objection to being touched please come out and tell me’, he would have no problem for all his subsequent lessons. However, most people don’t like to say no in front of others and also they might not realise that an unexpected push could hurt them. 4. If you are teaching classical Yang-style tai chi, some of the forms may involve turning the foot while the knee is bent with the weight on that foot. This can cause excess stress on the knee ligaments and can cause a twist injury to the knee. Consider amending the forms so that weight is shifted back before turning, to minimise the shearing force on the turns. 5. Tai chi requires the knee to bend and stay at that bent level throughout a set of forms. This can cause too much stress to a person’s joints. Make it clear to your students that while the goal of tai chi is to keep the knees bent, they should work up to that slowly. Encourage your students to stand up between movements, to avoid excessive stress to their knees. As their muscles become stronger, students will be able to stay comfortably and longer in a bent position. 6. Tell your students that when they bend their knees, they should make sure their knees are directly above their toes, otherwise they may overstretch and injure the ligaments on either side of their knee. 7. When their knee is bent, looking from the side, their knee mustn’t be pushed any further forward than the tip of their toes. Bending any deeper could cause too much strain to the ligaments. 8. Some movements involve a deep squatting position, with one knee touching the back of the other knee. This is a very stressful position for the knee joints, so you should modify this movement for your students to be well within their comfort zone. Be sure to warn any students who want to do the full range of the movement of the dangers involved. 9. Jumping can be dangerous, for example in the Sun-style Double Patting Foot. Make sure your students understand this, or, better still, modify the movement for them. 10. Advise your students to set up a regular time for practice, so their tai chi practice becomes a part of their daily routine. Regular practice keeps the muscles and ligaments well tuned, which helps to prevent injury. 11. Encourage students to talk to you about any movements they are finding difficult or uncomfortable. 12. Do all the movements slowly, continuously and smoothly. As students become more familiar with the movements, they will start to flow more easily and feel more graceful. 13. Breathe slowly, naturally and easily. As your students become more familiar with the movements, try to get them to coordinate their movements with their breathing, as instructed. If they find this feels uncomfortable, advise them to return to their natural breathing. 14. Advise your students to use the minimum effort necessary to do the movements and not to force any of them. This will help them cultivate qi and relax, and will also minimise injury. There are several common precautions that should be taken by people with special medical problems such as arthritis or diabetes. Check with your student’s health professionals to confirm what precautions are appropriate for that student. Many people have arthritis in the knee joints. Tai Chi requires the knee to bend and stay at that bent level throughout the set of forms. Students with arthritis should stand up between movements to avoid excessive stress to their knees, until they develop strong muscles and ligaments. In classical Yang-style tai chi, many people turn their foot while their knee is bent and their weight is on their foot. People with arthritis should transfer their weight or straighten up before turning to avoid injury. People who have had a hip replacement operation should avoid crossing the foot on the affected side of their body over to the other side of their body. During the replacement operation, the nerves responsible for feeling in the opposite side of their body may be cut, so people who’ve had this operation may not be able to balance well if their foot crosses the midline of their body. Doing standing qigong can have risk of injury because standing on one spot puts extra stress on the body, especially the knee and hip joints. You can use a safer qigong like those described in my Tai Chi for Back Pain program. Older people and people with arthritis can injure their knees by standing for a long time in a stationary position. If you want to correct a student’s position do not hold them in the same position for long. Holding a position can be especially stressful for older people or people with arthritis and they have an increased chance of injury from doing this. The shoulder is a very mobile joint that can be prone to injury. Many older people have arthritis and rotation cuff or other problems with their shoulders. Movements involving the shoulder should be done slowly, and moving the hands above the head should be done with care. Warn students to stop when there is any pain. The most significant danger for people with diabetes is hypoglycaemia. ‘Hypo’ means low and ‘glycaemia’ means blood glucose (blood sugar). So hypoglycaemia is having low blood glucose. When a person’s blood glucose gets too low, loss of consciousness and even brain damage can result. Hypoglycaemia affects diabetics who are being treated with medication or injections. Exercise causes a high consumption of energy and there-fore blood glucose can be depleted rapidly. The body has an efficient system to regulate blood glucose so that it stays in the right range. However, as medication or injectable insulin aims to lower blood glucose, they may interfere with the body’s regulatory system and cause hypoglycaemia. This is why people with diabetes should let their doctor know what kind of exercise they are doing. Most people with diabetes are well prepared by their health professionals to recognise signs and symptoms of hypoglycaemia. They are taught what to do. Most people with diabetes who are likely to get hypoglycaemia bring with them some food, drink or candies (such as jelly beans) just in case. Encourage them to feel comfortable with sitting down and eating whenever they feel the need. Some might bring a medication set with needle, syringe and testing kits. Don’t be alarmed if they use it. Occasionally though, a student can lose consciousness too quickly, before you can take these preventative measures. Use your first aid training to position the student and call an ambulance (or if you’ve pre-arranged it with an assistant, get them to call while you attend to the student). It is important not to assume the role of a health professional in a class. The teacher has responsibilities similar to those of an exercise leader and you should use your first aid training to do what is appropriate. However, beyond that, seek medical help. Rule 1 Work with health professionals. Resist the temptation to play doctor. If you tell your student that their pain is minor and that they can continue to exercise, it could be considered that you’ve made a diagnosis and instituted medical treatment. As a practicing doctor, like Dr Pam Kircher, I seldom practice medicine in my teaching sessions, unless, of course, it is a medical emergency. If you are not a legally qualified health professional in your country, don’t do anything you are not qualified to do. Rule 2 Listen to your students carefully. Listen not only with your ears, but also with your eyes and your heart. If someone tells you they are not in pain but they look like they are in pain, they probably are. Advise that person to stop and consult their health professional; it is better to be safe than sorry. Remember to respect students’ rights and just give the best advice possible as a tai chi teacher. Rule 3 Encourage your students to listen to their bodies and to work within their comfort zone. Create a relaxed atmosphere in your classes so that your students feel comfortable about stopping and resting anytime they need to.